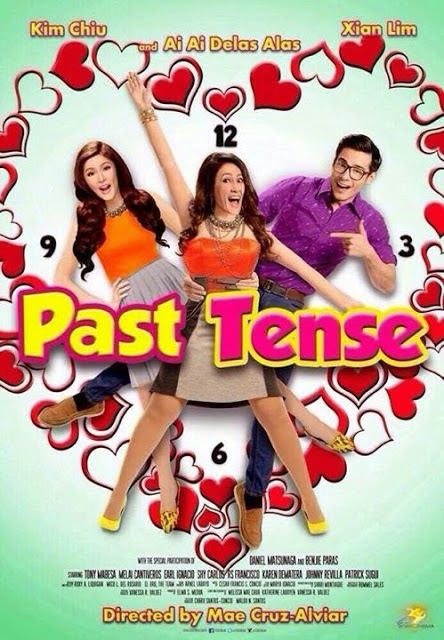 Star Cinema has recently launched the official movie trailer for its upcoming comedy movie entitled, "Past Tense" starring the blockbuster tandem of Kim Chiu and Xiam Lim together with the Tanging Ina blockbuster queen, Ms. Ai Ai Delas Alas. The movie also features the special participation of Pinoy Big Brother All-In Big Winner, Daniel Matsunaga. Regretting certain decisions she made in her life two decades ago, Ai Ai Delas Alas' character is seen transported several years back to meet her self as Kim Chiu through the magical powers of Benjie Paras' character. Ai Ai Delas Alas is set out on a mission to convince her younger self (Kim Chiu) to give her best friend, portrayed by Xian Lim, a chance to win her heart over and hopefully end up together in the future. "Past Tense" is directed by Mae Cruz-Alviar, who is also behind Kim Chiu and Xian Lim's box-office movie last January entitled, "Bride for Rent." "Past Tense" is set to be shown in a nationwide release on November 26, 2014. Watch the official full movie trailer of "Past Tense" below. Enjoy! Prior to the emergence of television, most people turned to various print media, along with radio, to keep informed. "Past Tense" is another Filipino romantic comedy with re-used plots filled with over-acted scenes by actors who look handsome/pretty but have no depth to their acting talents. Why are most Filipino movies so dumb? Movies like this insults the Filipino public, assuming they have the comprehension level of 3rd graders that they find movies like "Past Tense" entertaining.